Nick Pyenson is a whale paleontologist working for the Smithsonian in Washington, DC. Although whales may not have captured the paleontological imagination the way dinosaurs have, maybe they should. 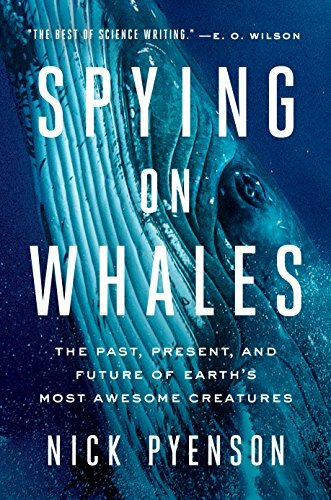 In his 2018 book Spying on Whales, Pyenson reminds us that whales are the largest creatures that have ever lived. Although the largest brontosaurus might barely exceed their length from nose to tail, the blue whale is much more massive. In weight, they are many times heavier than any dinosaur, heavier than any other sea creature that has ever lived, and they are living in our oceans right now. Although Pyenson is a paleontologist, he also studies living whales. Spying on Whales is not just about fossils and times long ago. Pyenson takes the reader to current expeditions where living whales are being watched and tagged. Clear-eyed about the realities of a world where whaling remains an ongoing concern, Pyenson also takes us on board a whaling ship and to a whale-rendering plant in Iceland. He acknowledges the ethical dilemmas faced in using these operations for scientific research and is clearly conflicted by the choices he has made. Whaling has not stopped, and his presence neither encouraged nor discouraged the whalers. He and other scientists have made some groundbreaking discoveries from the fresh carcasses of the killed beasts. Whether that justifies his presence there or not is left to the reader to decide. Much less controversial is his work with fossilized whales. Pyenson takes us to Chile, where several layers of whale skeletons were discovered when a road was cut through a high mountain desert. Walking in the footsteps of Darwin, Pyenson tells a gripping story of how a local paleontologist made the discovery, how the Smithsonian was able to field a team to not only help with the dig but also to pioneer techniques in x-ray mapping the bones in situ, and how this all had to be organized and accomplished within a month because of the demands of the road construction timeline. Pyenson is a good story-teller and he gives much of the credit to the rest of the team. The working theory is that there were at least four occasions within a few thousand years when an algae bloom wiped out huge numbers of local creatures, not only whales but fish, birds, and other sea mammals. Those animals died and washed ashore in what was then a low lying area. Much later when the region was lifted above sea level by plate tectonics and then later still when it was exposed by the road construction, several virtually intact skeletons of early whales were identified and preserved for study by the team. Whales today are known for their size, although there are a few that are quite small. Unfortunately, most of those smaller whales are very endangered. It is likely that the Yangtze River dolphin has gone extinct, and a species of small dolphin in Mexico has fewer than 30 remaining individuals. Many larger species were hunted nearly to extinction. Blue and right whales may never recover their pre-whaling numbers, Humpback whales, though, seem to be nearing or at their pre-whaling numbers, and gray whales may be using new ice-free channels through the Arctic Ocean to recolonize the Atlantic, where they had not been seen for centuries until recently when two individuals were spotted far apart from each other. Whales today face many challenges. Although hunting is greatly restricted, it has not ended. Climate change is putting new pressures on whales, potentially affecting their migration patterns and feeding habits. Thousands of whales are killed accidentally by ship strikes and by getting caught in fishnets. Plastic and other pollutants are being eaten by whales with unknown consequences long-term. And the sounds made by our industrial and military work in the ocean has unknown effects on animals which use sound to communicate over vast distances. One other unknown effect humans have had on whales is changing the whales’ cultures. Whales communicate, and different whale pods have developed different cultures. For example, although they are biologically indistinguishable, there are three distinct cultures of orcas in the Pacific. One culture eats salmon almost exclusively, and stays primarily in fixed locations near the mouths of rivers where salmon go to spawn. Another group travels up and down the coast and eats primarily marine mammals. The third is much more oceanic than the first two, and their hunting is focused largely on sharks. Although there is no difference in the DNA between the three groups, they seldom interact and in their behavior patterns they are essentially different subspecies. Distinct cultures have also been observed in pods of sperm whales…but sperm whale populations were devastated by whaling ships. We will never know what effect the depopulation of the species had on its culture, nor will we ever know if or how that can be recovered even if the population rebounds. Spying on Whales is a warm book about fascinating creatures. It is a great book for kids interested in science (it ends with a heartwarming story about the accidental discovery of a whale skull by the author’s preschool son–and how there is now a specimen in the Smithsonian’s collection whose discovery is credited to the child). It is also a fascinating read for those of us who maintain our childhood fascination with science and with the amazing creatures that share this planet.